Nothing in the House: Happy Pi(e) Day! Today is the day! All across the country (world? ), it seems, folks are rolling dough, fluting crusts, and memorizing pi to the 50th decimal point to celebrate International Pi(e) Day 3.14 today! 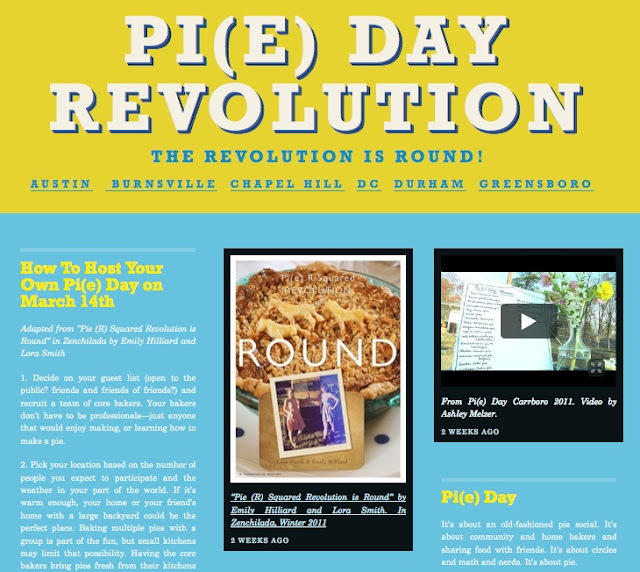 My friends Lora Smith, Ronni Lundy and I set up a little website to connect various Pi(e) Days, which you can find here (image below). We'll be posting documentation from each event--I can't wait to see what the folks in Greensboro, Burnsville, Chapel Hill, Durham, and Austin have whipped up! Here in D.C. we will be celebrating with a benefit for D.C.'s community-powered radio station, Radio CPR (Find more here and here). Make your way to St. Stephen's church tonight for all-you-can eat pie (first come, first served), live old-time music, Radio CPR DJs DJing, and a Pi(e) Walk where you can win a pie to take home, all with your $5 donation! We've been getting a lot of great press about the event (ReadySetDC, Refinery29, Panda Head & the Washington Post, to name a few) and are very excited! Plus it's a beautiful spring day! Come on down ready to eat and bring a fork!